Make the most of a layover in Cairo with a custom day trip direct from the airport. Your guide meets you at arrivals and takes care of all of the logistics. See the Pyramids of Giza, the valley temple, and the sphinx with local insights and creative camerawork from your guide. Then continue on to the ornate Alabaster Mosque of Muhammad Ali located in the citadel. Next have a break for lunch (own expense) and a then final stop in Old Cairo to see some of Cairo’s historic christian churches, before retiring to the airport. As per requested arrival flight time Start your day tour with pick-up from Cairo airport. You will meet your expert tour guide who will be waiting outside the terminal at the street exit gate with a sign of your name. 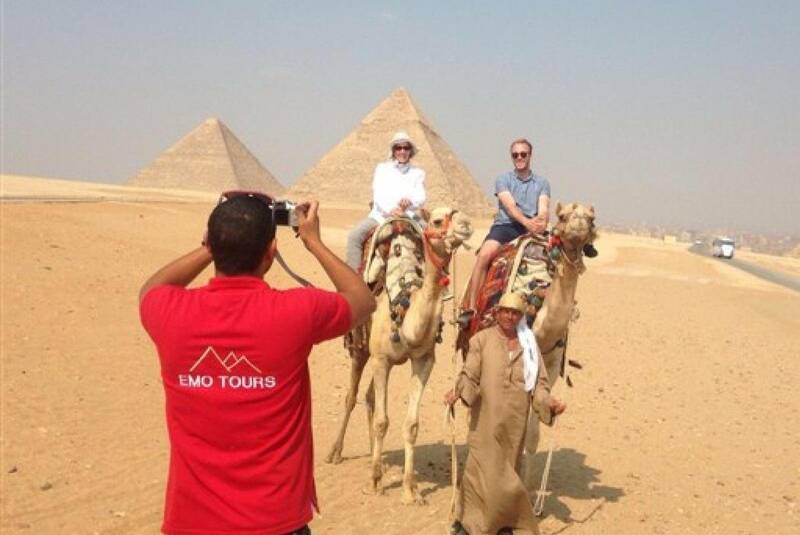 You will be then be transferred to the great pyramids where your local tour guide will share with you the history of pyramids. Learn about the pyramids of Cheops,Chefren and Mekarenous and queens pyramids then move into the valley temple and learn about the process of mummification then get close to the sphinx. Our your local guide will assist you in taking very funny pictures. Then visit the alabaster mosque of Muhammad Ali which is located at the Citadel this is the most beautiful mosque in Egypt as decorated extensively with pure gold it dates back to 1824 AD where you will have the chance to learn about Muslim religion. Then end your day with old Cairo where you see some of the earliest christian churches at Middle east from 300 AD visit the Church of Abu-Sergah and St. Barbara, the hanging church, and the old Jewish synagogue called Ben Ezra Synagogue. Around 16:00 you will be transferred you back to Cairo airport.